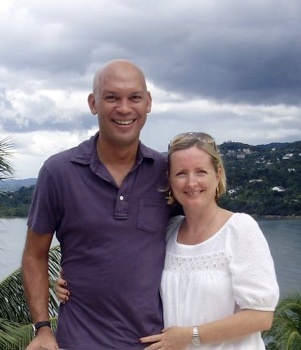 Patrick Casserly is one of Jamaica's and the Caribbean most accomplished entrepreneurs. Katrin, his wife, has worked with Round Hill Hotel and Villas for 18 years in various positions. Patrick and Katrin’s family have been wearing Wright Style for many years. A long friendship with Pat combined with one evening of "lyming" (Jamaican expression for 'good time") resulted in the birth of Schatzie Limited. Schatzie Ltd is committed to bringing back 100% linen resort wear, that is solely manufactured in Jamaica. Linen is versatile, stylish, airy yet elegant. Schatzie Ltd has also introduced beach cover ups made out of cotton voile with a children’s line following soon. Schatzie Ltd owns the concession for the Round Hill Gift Shop & Boutique at Round Hill Hotel and Villas, manages the Tryall Boutique at Tryall Golf Club in Jamaica and opened Schatzie Boutique at Fairview in Montego Bay offering the Wright Style line and other Jamaican labels.